Pfeiffer Nature Center received a gift of 460 acres from Col. Charles Eshelman, a friend of Wendy Pfeiffer Lawrence, founder and original benefactor of the Nature Center. Col. Eshelman followed in Wendy’s footsteps, donating the property in 2002, tripling the Center’s initial holdings. Unlike the Nature Center’s original land on Lillibridge Road which has a strong preservationist underpinning, upon making the donation Col. Eshelman clarified his desire that an active management style be used and that the property be returned to its farming roots to the extent possible. With this as a backdrop, the Nature Center located a young family interested in renovating and moving into the original homestead and establishing a small farm. That family remains on the property, and provides caretaking services in exchange for its use. We actively manage our woodlot, rent our maple trees during sugaring season, and do our best to combat invasive species and maintain our open meadows. In 2006 the Nature Center began building trails on this property, starting with three miles of loops, all on the east side of Yubadam Road. In 2007 we installed 31 trail markers, made from 100-year old staves from an old silo that was part of the early farming operation. This is one example of how the Nature Center incorporates our historical roots into our current activities. Visitors can pick up a full-color trail map to guide them on their hikes as well as view the permanent trail map and current program listings at the kiosk. 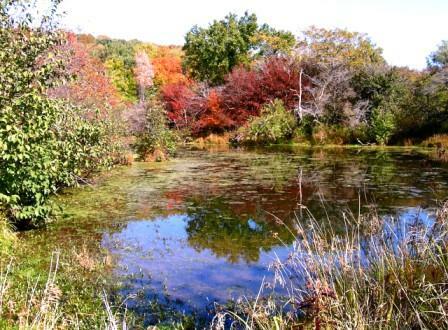 The forests, fields, streams, and ponds on this property are a combination of nature’s handiwork and human influence. The original farmers needed the diversity of landscape for their livelihood, and the Nature Center continues to actively manage the property to retain its character for human and non-human visitors alike. With plenty of transitional zones (the edges of fields and forests, streams and meadows), wildlife abounds. These edge areas are alive with bird populations spring through fall. Quiet visitors are likely to encounter deer, turkey, bears, raccoons, beavers, otters, muskrats, and a wealth of reptiles, amphibians, and insects.